Last week, Stuyvesant Town management opened a brand new fitness playground, the first of the complex’s playgrounds to be completely renovated and outfitted with a key-card entry system. At the ribbon cutting, General Manager Rick Hayduk announced the other playgrounds would eventually follow, not only in being renovated but in becoming key-card access only. This is now Blackstone’s property and the owner can of course do what it wants to the playgrounds. However, before this plan is put into action, we hope management reconsiders completely shutting the playgrounds’ gates to outsiders. Granted, for years, signs on each playground clearly state that Stuy Town/Peter Cooper is private property and the premises are intended for residents’ use. However, we see nothing wrong with the current system, where non-residents are still welcome to visit a playground so long as a) they’re not being rowdy, b) they haven’t confused some part of the property for a dog run and c) they’re not crowding out actual residents. A few years ago, management began having monitors check IDs at the busier playgrounds to prevent this from happening, and it seems to have worked. We realize a key-card access system is cheaper in the long run than having someone staff the playground so maybe having such a system at just the busiest playgrounds could be a good compromise. The rationale behind this key-card entry plan is to make residents feel safe. Another way to do this would be to have more boots on the ground, worn by public safety officers. The sight of more security people still seems, to us, less intimidating than gating off the community, bit by bit. We are not knocking gates, by the way. They work well at some places, like Gramercy Park, where the space’s exclusivity is its main selling point. But ST/PCV isn’t Gramercy Park, and we’re pretty sure its accessibility — without the pressure of a guided visit by a leasing agent — has helped rent more than a few homes. While the makeup and demographics of the complex has changed over the years, and perhaps roller hockey is now not played every day in this playground, it would be a real shame if it went the way of other great memories and facilities in PCV/ST. You see, growing up in Stuy Town, you were almost always identified or associated with what playground you hung out at or came from. Playground 7 was different, though. 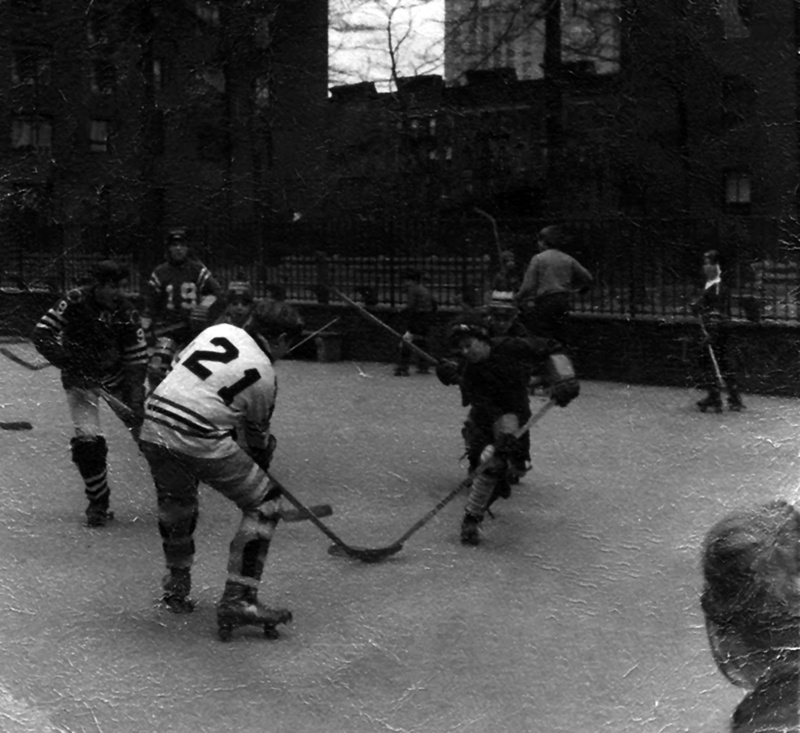 When it came to hockey, all roads led to Playground 7. 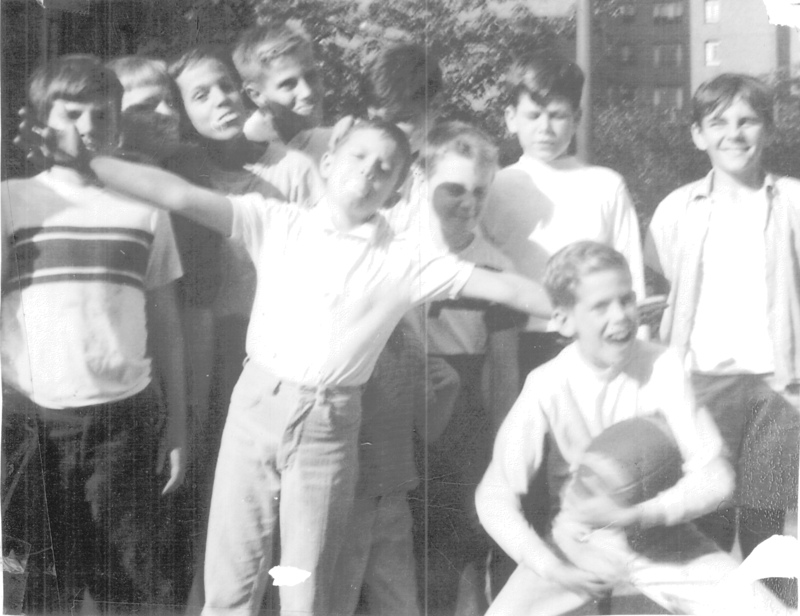 Whether it would be rushing home from school every weekday from late September to mid-April to “lace ‘em up,” or participating in the Recreation Department sanctioned leagues, this was our life blood and formed lasting lifetime friendships! Two men have survived being shoved onto subway tracks in separate incidents, within one week of each other. In both cases, the victims suffered only minor injuries. A 41-year-old man also suffered minor injuries after his girlfriend allegedly pushed him onto the tracks of the L train at the Union Square station after an argument last Monday at 6 a.m. The New York Daily News reported that the man initially told police that he’d fallen onto the tracks when the train pulled in the station. The train rolled directly over him, trapping him underneath it, but he only got a cut on his toe and a minor head injury. He was treated for his injuries at Bellevue Hospital and was released. No arrests have been made. A man employed as a caretaker by an elderly resident was caught taking pictures of kids as they played in a Peter Cooper Village playground this week. A resident shared news of the incident on the Stuyvesant Town Peter Cooper Tenants Facebook page this past Saturday, saying it happened as her daughter and her daughter’s friends were at the playground. The man was reportedly sitting on a bench in the playground and when the kids suspected he might be filming them, one snuck behind where he was sitting on the bench and found that he was, in fact, taking photographs. They asked him if he was taping them and he said he was, and when they asked why, he reportedly said it was because he wanted to. The girl’s father then approached the man, asking if he had a child in the park. The man said that he didn’t but was the aide of an elderly man also sitting in the playground. After the girl’s father called security, the aide said that he wasn’t filming the kids but he handed officers his phone, which had photographs of the children on it. The resident who reported the incident noted that the man was not charged with a crime because NYPD said that citations are only issued in city parks for being in a playground without a child. Since ST/PCV is private property, such matters are left up to the Public Safety department, who reportedly deleted the media on the man’s phone before returning the device to him. A Stuyvesant Town senior was struck on the head by an errant hockey puck, as he sat on a bench outside a playground, he told Town & Village last week. The resident, who didn’t want his name published, said he was on the bench on Friday, August 14, with a female friend, when the puck flew out of the playground behind 250 First Avenue. Instinctively, he jumped up when it hit, thinking he was being attacked, possibly as a part of the “knockout game,” in which thugs around the city have attacked people randomly with one blow. Soon, however, he realized the puck that had sailed over, hitting the side of his head, was being used by a young man (the resident said he looked around 19) for practice, as he was by himself. 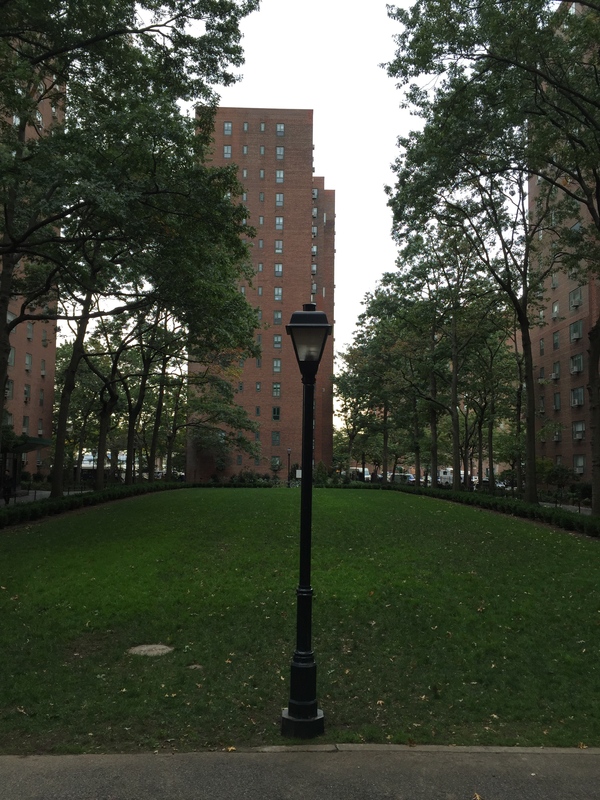 The following story was submitted by former Stuyvesant Town resident Brenden Crowe. The greatest place to grow up in the 60s and 70s was Stuy Town and the greatest playground there ever was, was playground 5. To those who don’t know Stuy Town, it has 12 playgrounds. Each playground is different. Some playgrounds had swings and slides, some had basketball courts, and some had paddle tennis courts. Playground 5 was a rectangle playground about 75 yards long and 35 yards wide. It was a perfect playground to play football, hockey and punch ball. Those were the sports Playground 5 guys were good at. Playground 9 and Playground 11 had basketball courts and they were good in basketball. The playground you lived on decided what sports you would play. There was great pride in the playground you lived at. On Wednesday, Stuyvesant Town’s management told Town & Village that the company ZogSports, which had been holding events in playgrounds that at least in one instance shut out residents, would no longer be doing so. The company was cut loose from the property following a flurry of complaints from residents about one woman being shut out of Playground 3, while she was with her children. The woman, Stephanie Smith, had posted about the situation on the STPCV Tenants Association’s Facebook Page on Tuesday. In response to the complaints, Joe DePlasco, a spokesperson for CWCapital, said the company hadn’t been renting out the space but was permitted to hold events in a few different playgrounds for a few nights a week in exchange for sports equipment that would be donated to the property. Residents could participate in the programs by signing up through Zog, he added. However, by late Wednesday, that arrangement, which predates CW’s control of ST/PCV, was no more. “They reviewed park usage based on complaints and given concerns they will discontinue Zog usage of their facilities,” said DePlasco. Meanwhile, the shut-out had triggered enough attention that even Council Member Dan Garodnick made an inquiry into the issue. 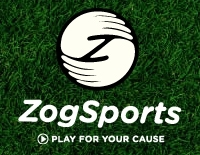 Along with Stuyvesant Town, ZogSports, which calls itself a charity-focused league on its online bio, holds events at a number of locations around the city. Washington Irving High School, the playground used by Simon Baruch Middle School and the playground used by P.S. 19. are just a few.